It seems that nowadays everyone has an account in any or even several social networks. Social networking has become the place of sharing information, offering services and goods. Lots of people use such platforms for finding knowledge. 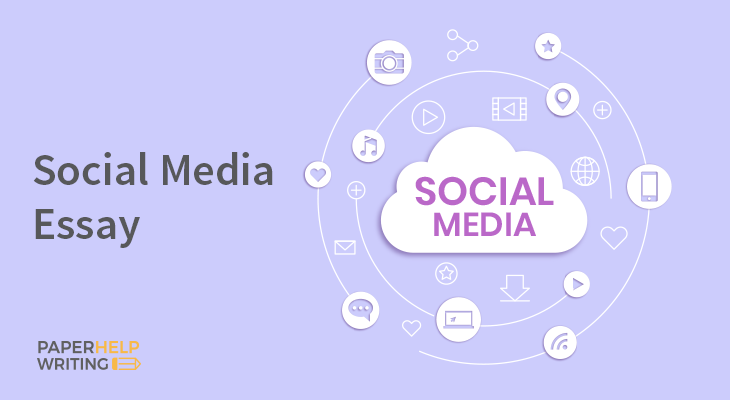 All active users strive to make their profile interesting and attractive for readers, thus, learning how to write your social media essay is just what you need. When a student is assigned to compose a social media essay, they have almost unlimited space for their imagination. You will find this article useful in terms of the basics and trips and pitfalls of this composition type. You will find out about the structure of the essay and how to write each of the parts separately. You will find a list of useful tips for an ace essay prepared by our expert writers. If you know the basic principles of composing a social media essay of persuasive characters, you will not find this assignment too complicated. You simply take your topic, analyze it and use numerous methods of writing persuasive compositions. Keep in mind to follow the relevant style of writing. You should include an impressive thesis in the first section of your paper. Like any other phenomenon, social networks have pros and cons. There are always both positive and negative sides. One of the negative aspects is the influence of social networking on youth. Kids and teenagers have unstable psyche, they are still in the process of personality development. And they are unable to define when they should stop using such online platforms. They do not guess they should make pauses and rest. The world of social networking has long proved to be challenging for young people. This is why it is essential that parents describe and warn about the possible dangers their kids may be facing in social networks. Parents, as more experienced and mentally stable internet users, should use different methods of control and provide support for protection of their genes from possible mental harm. What dangers your kids could be facing? The most common problem is cyberbullying. Why does it happen? Rebellious teenagers look for the way to prove they are better than others, and they find no better way than bulling. The Internet is a perfect place for it – nobody will punish you for that. There are kids who are eager to get more likes and subscribers to their account. When children spend too much time socializing online, family connections break first of all. It is worth noting that the most prominent problem families face nowadays is lost the skill of live communication. Progress is good of course, but besides positive things, it has serious negative aspects. It is time to admit that we are not ready for the bulk of information we are getting from everywhere. Spending too much time online does not only deprive you of the beauty of life but also worsens the relationships inside the family. For some reason, online friends, online communication and popularity have become more important for us than reality. It seems that real life became uninteresting for us. It is possible to fix the problem and to reestablish communication in the family if all parties admit the problems and take measures to move toward each other. The most important is identifying the problems as soon as possible. There is always a chance to fix everything. Who knows, maybe the situation happened because of the lack of support and love in relationships. It is essential to remember that real life is wonderful, real friends are always here with you no matter what. Another common type of social media composition is to compare and contract its advantages and disadvantages. In such an essay you should present your personal attitude to the theme you are covering. And it is not only talking, seeing each other but sharing some media materials. This is what makes social networking one of the coolest human inventions. Nowadays social media has become a popular tool for developing business. This is the place where many companies look for customers and advertise their goods or services. The company may become internationally known quickly since the internet is available anywhere in the world. The disadvantage of it is that people prefer online shopping oftener and oftener. This is not good for small businesses or shops. However, there is a negative side of social networking. When using it too often people become obsessed with social media. This obsession makes them forget about the reality and real people surrounding them. Thus, relationships with family members and friends may break. Each person decides for themselves how to treat social networking – se only good or bad about it. Nowadays, nobody can say what will happen to social networks in the future. After extreme popularity, they have revealed their dangerous side. It seems that the biggest negative impact social networking has on youngsters. Cyberbullying is what kids and teenagers face there. With the increasing threats, the governments will likely want to control the most popular networks soon. The problems I as simple as that – since people add their personal information to their profiles, add their locations and other data, it is possible to find anyone there. Choosing a good topic is essential for a successful composition. When you have to start an essay begin with selecting an interesting theme. Why is the topic so important? It’s simple – if you choose a difficult topic or the one that is not something you are interested in – you may get stuck in the middle of the process and get tired of it. This, in turn, will lead to unsatisfactory outcomes. It is advisable to find the golden mean – take an interesting, yet deep topic. Something that you will be excited about and you will find what to say about it. A winning theme will be the current one that everybody discusses. – Can social networks ruin personal life? – How to spread peace around the world via social networks? – Should governments control social platforms? If you find the task to write a composition on one of the social media topics, you should use the assistance of experts to get the job done for you. Our team of expert writers has relevant education and experience in producing winning essays. We are available around the clock all days of the week for your convenience. You need to fill in the form, and our manager will contact you for further details. Wait no more – get your customized essay written professionally and by the deadline!